Now that August is over, you might want to review your energy usage for the month, just like I am doing. Although we had a remarkably mild August, we still had a very steep peak demand back on August 4, and, had our 2016 rates been in effect, it looks like my bill would have been about $6 higher under the new rates. You can, and really should, check out how the new rates would have impacted your home or business and see your comparison, just like the one shown above for my home, by going to https://portal.glasgow-ky.com/login.php and logging in, or signing up if you haven't yet done so. We are sure that you will find the information interesting. 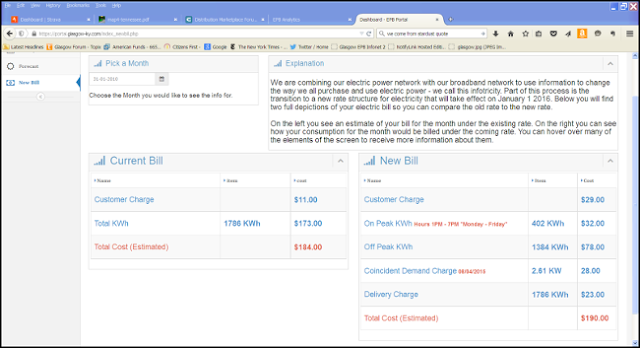 After you sign in you can click on the icon titled "New Bill" on the left side of the page and you will see your information just like mine above. At my house, the bill under the new rate would have been a little higher for one reason -- on August 4 at 3:00 pm my home was pulling 2.61 kW, and if I had gotten it down to 1.5 kW, I would have actually saved money under the new rate. I was trying to keep my home's load down that afternoon as the weather was quite hot and EPB was using several methods to advise the community of a possible peak demand for the afternoon of the 4th. I made sure no one was running major appliances during the afternoon. I also set my thermostats to pre-cool my home in the morning so that I could comfortably raise the temperature setting to 80 degrees in the afternoon, but I still wound up with a little more load on peak than I wanted. It got really hot that afternoon and, even with my thermostat set to 80 degrees, the air conditioning kicked on during the 3:00 peak hour and that set my demand at the 2.61 kW shown above. When you check your bill comparison, you might find that you did better than me by keeping your load below 2.61 kW, or you might find that your home's air conditioning and other major appliances combined to give you an even higher Coincident Demand Charge. If you were higher, then that is why we are talking about this months before the new rate goes into effect -- so you can be making plans to have a low kW demand during Glasgow's peaks. You still have several months to practice. We know that over 2/3 of our electric customers also have internet service. If you have access to the internet, we cannot give you better advice than to sign up for your personal EPB meter portal and login often to monitor your energy usage, as well as look at the old vs. new bill comparisons to help you understand how to change your energy usage in 2016 to minimize your energy costs.